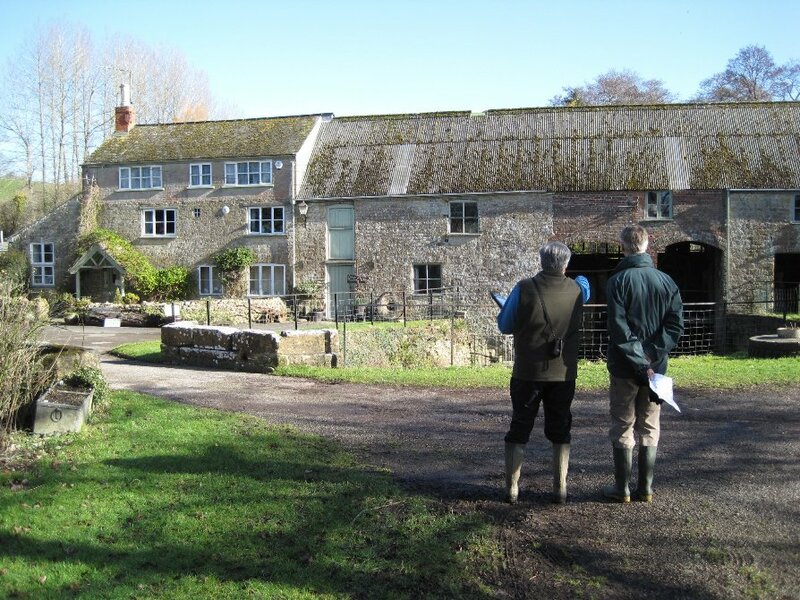 The purpose of the walk was to conduct a first-hand survey of the various barriers to fish migration on the stretch of the Mangerton Brook between Mangerton Mill and Milton Mill. 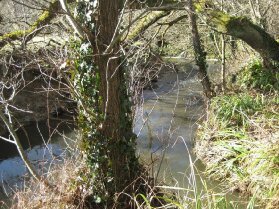 Mangerton Brook is a tributary of the River Asker joining it at Bradpole. The migration of salmon and sea trout from the sea at West Bay up the Brit/Asker river system should, in theory, be possible following the installation of fish passes at Palmers Brewery (2011, at the confluence of the Brit and Asker) and Jessop's Flood Defence Weir on the Asker (2010). Two feasibility studies in relation to the removal of barriers to fish migration on this part of the river were conducted in 2012 (Apem) and 2013 (Fishway Engineering), as well as a further review by the Environment Agency/Frome, Piddle Fisheries Association/Friends of Rivers Programme Board (2013). The latter produced a map of this section of the river which is included below. 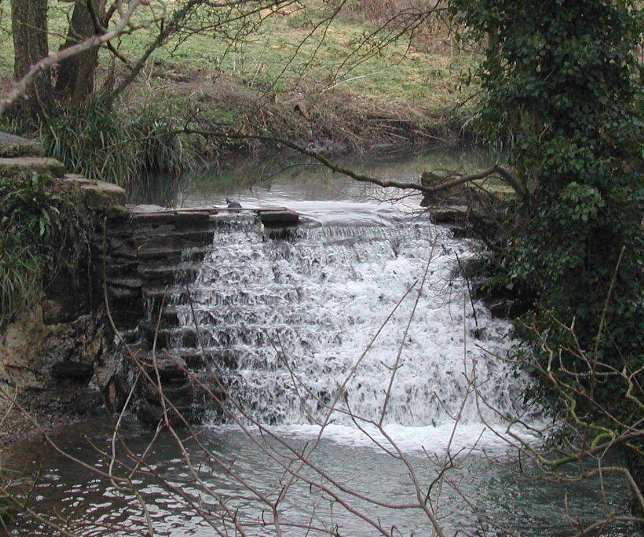 The first task was to establish the nature of the barriers at Mangerton Mill. In essence it appears quite straightforward: the mill leat is taken off the main river at a weir with hatches some 200 metres or so upstream of the mill beyond the field which serves as a site for touring caravans during the summer season. 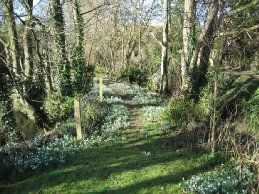 It is accessed by a footpath running alongside the river. Over the passage of time the mill leat has become wider so that to the casual observer it appears to be the main stream from the weir to the Mill. 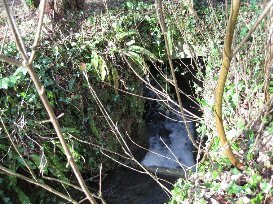 The leat passes over the water wheel at the Mill into a tail pool. 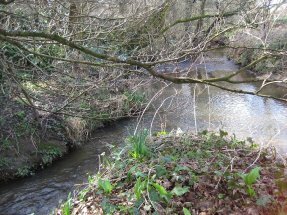 It then continues alongside the river by the side of the track leading from the lane to the Mill for about 100 metres before rejoining the river just before that lane. 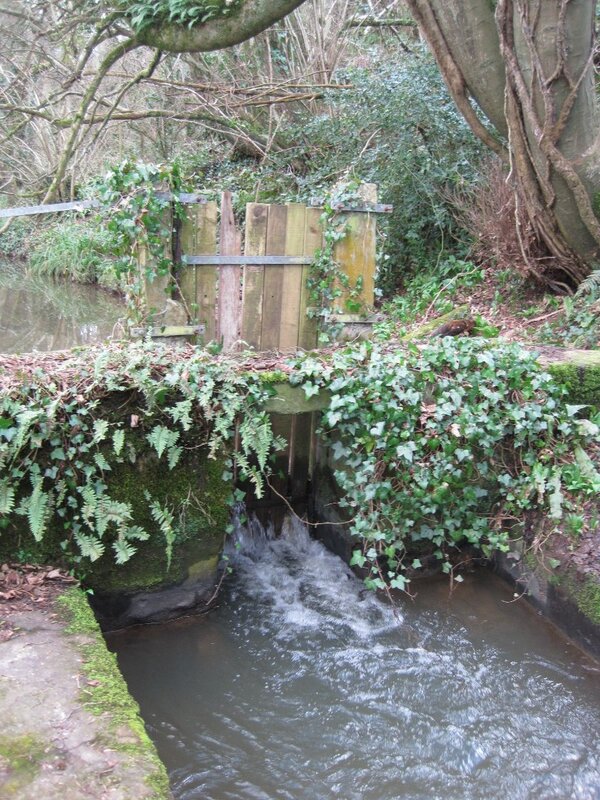 The first barrier to be tackled, therefore, is the weir with hatches (Barrier 4) above Mangerton Mill. One issue that will also have to be considered is whether fish migrating upstream will take a right and follow the mill leat up to the tail pool at the Mill rather than taking the left hand stream to the weir. 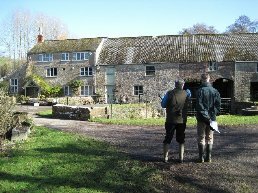 We then followed the course of the river through the grounds of Mangerton House and across the field to Milton Mill. 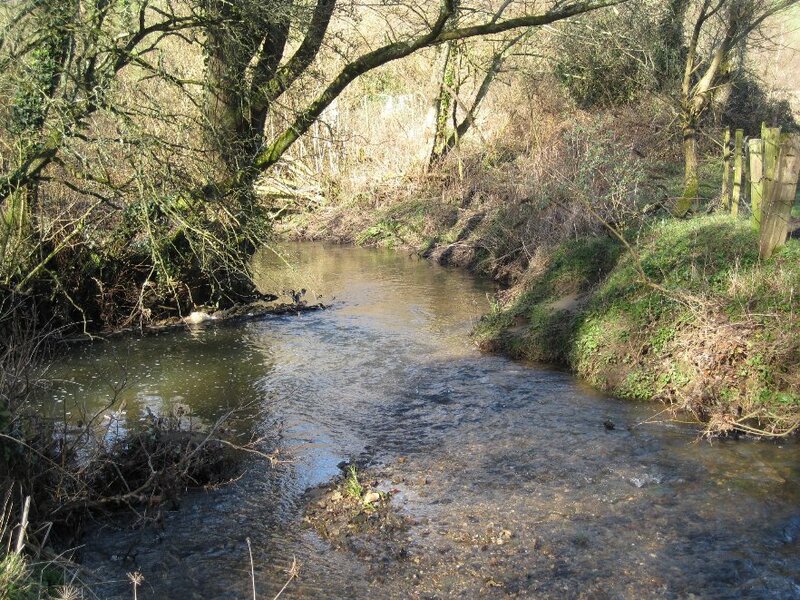 The fishermen among us commented that this stretch of river appeared to provide excellent habitat for migratory fish with numerous stretches of gravel offering perfect locations for spawning. 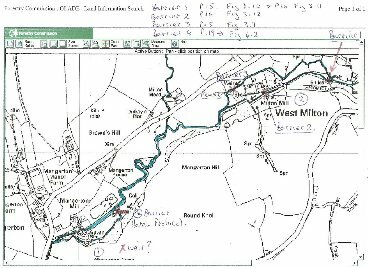 The second task which we had set ourselves was to understand the various barriers in the system of streams and mill leats around Milton Mill. The owner had kindly given permission for us to walk through the grounds of the MIll to do this. 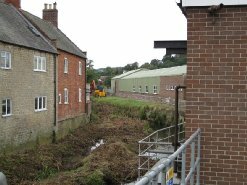 Again the situation seems quite straightforward: the mill leat is taken off the river at a large weir about five hundred metres above Milton Mill. It is accessed through the field at the bottom of Larcombe Lane where it enters Milton Mill; a public footpath runs through this field to a bridge across the river just below the weir. 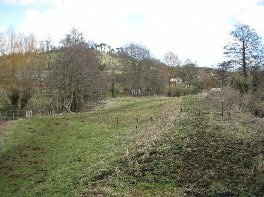 Field below West Milton Weir, with public footpath leading to bridge across the river near left: Weir is located at the top of the field on the right. 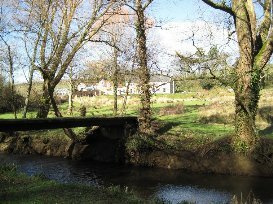 The mill leat runs from the top right-hand of the weir through a hatch, down along the side of the field mentioned above, under Larcombe Lane into the grounds of Milton Mill and through a further weir(Barrier 2) where the flow was historically diverted through the mill (now blocked off). 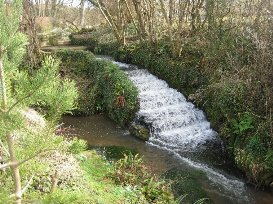 It then flows on through the grounds, taking two dog-legged turns with one set of sharp drops at the second dog-leg, eventually rejoining the river some 50 metres further on. 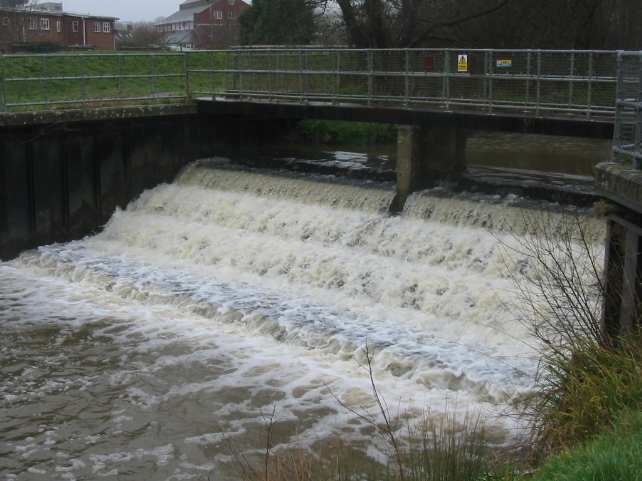 The second barrier to be tackled is the weir (Barrier 1) above Milton Mill. This is a substantial structure and will require a major engineering solution. On the face of it access may be a problem for contractors. 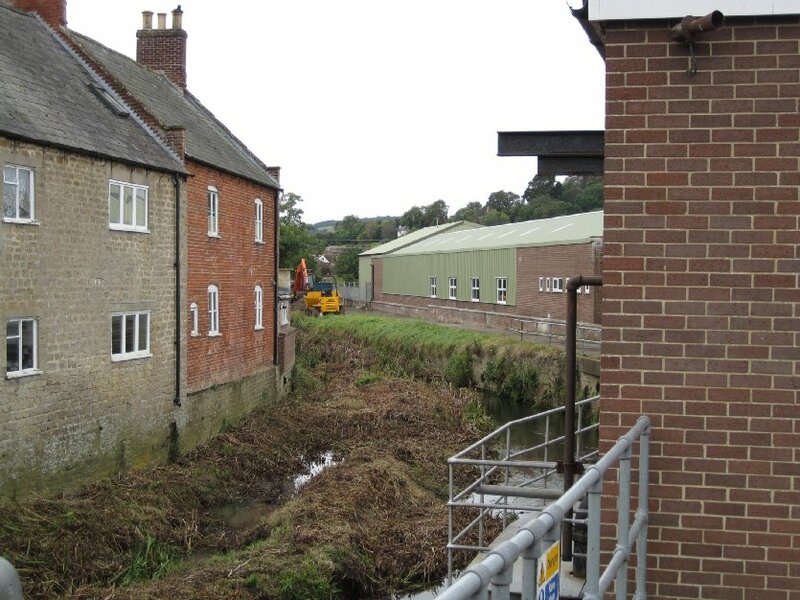 One other issue that may have to be considered is the single step on the river where it skirts Milton Mill before joining up with the leat (Barrier 3). 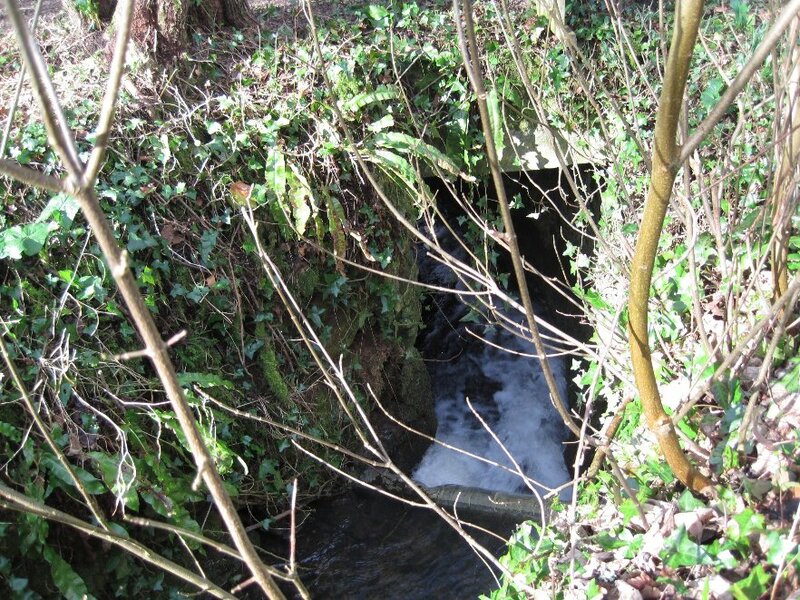 This is not a significant obstacle and may not present a barrier to fish migration when the river is in spate. As at Mangerton Mill, there is the issue of whether migrating fish may be inclined to swim up the mill leat rather than up the river at the confluence. The various barriers on the mill leats at both Mangerton Mill and Milton Mill do not appear relevant to fish migration. With thanks to the owners of Mangerton Mill and Milton Mill who gave permission for us to access the various barriers on the river, and to the Marquis of Lorne where we had a splendid lunch. 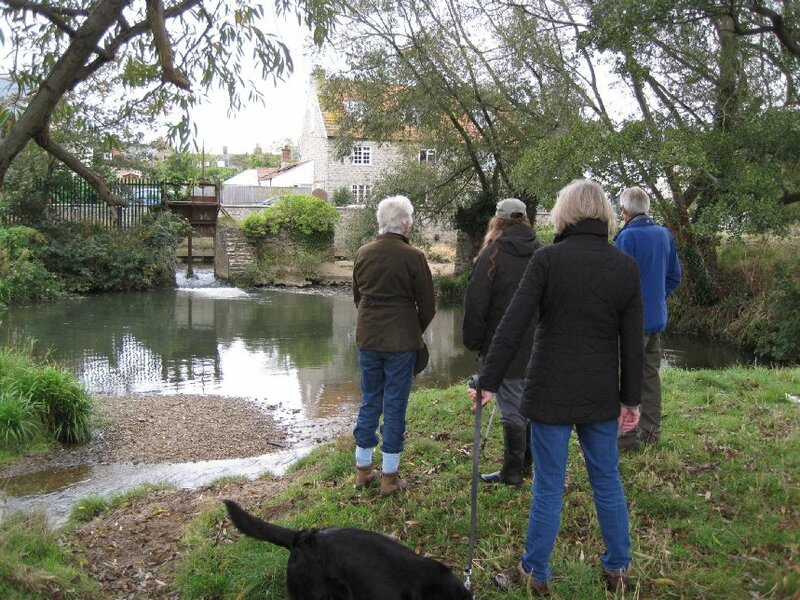 This walk marked the completion of the fish pass at Gundry's Weir. It began at Palmers Brewery, followed the River Asker up to Jessop's Weir and then across Coneygar and Victoria Grove, through the fields, past South Mills finishing up at Gundry's Weir on the River Brit. These three weirs - Palmers Brewery, Jessop's and Gundry's- were the major barriers to fish migration from the sea at West Bay harbour. 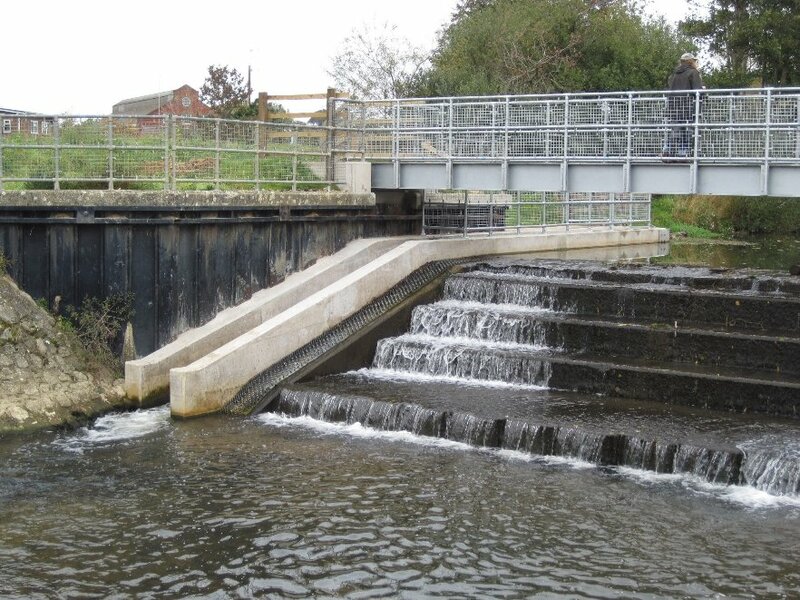 Now the fish passes are completed, fish are able to negotiate these barriers and migrate significant distances up the river system in order to spawn. Rendezvous for the walk was at the weir at Palmers Brewery. The select few that could make it included Roger Guppy, Pat Hughes, Geoff and Diane May and John Wreford. The weather was distinctly autumnal but we were spared the rain. The purpose of the walk was to visit the three major obstacles to fish migration on the Brit and Asker nearest to the sea. 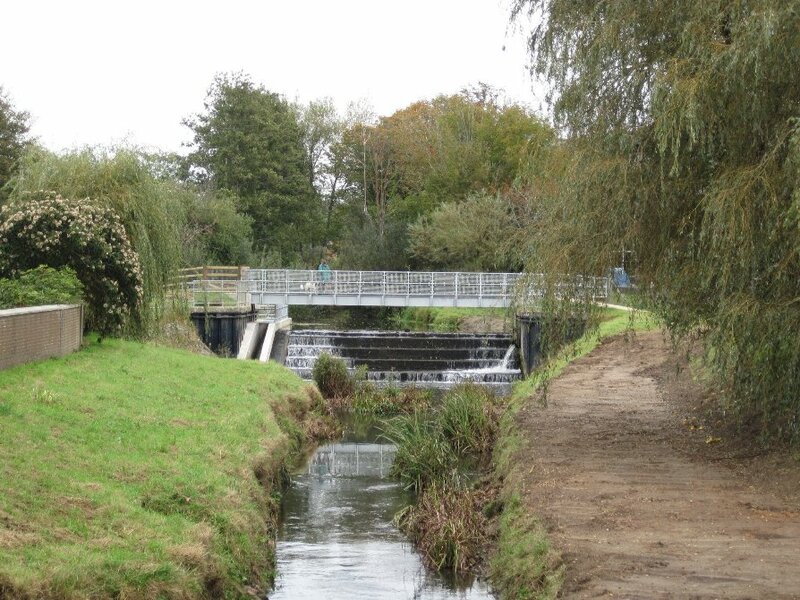 The Larinier fish pass at Palmers Brewery was completed in August 2011. 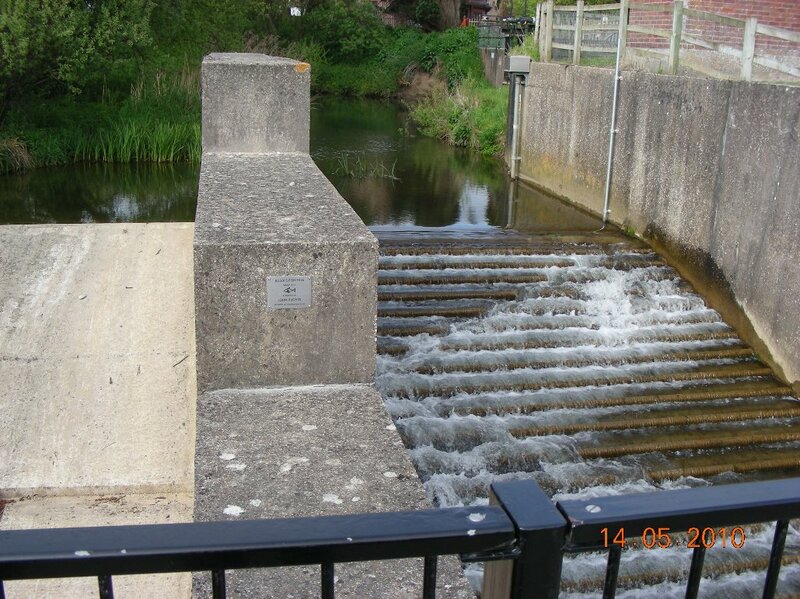 It was the second fish pass installed on the river at the confluence of the Brit and Asker. The project was initiated by the Frome, Piddle and West Dorset Fisheries Association who obtained the funding from Westcountry Rivers Trust. The prefabricated structure was installed on a concrete ramp built into one of the existing hatches which are adjacent to the weir. Prior to its installation, fish migration was possible through the hatches but only if they were opened. Now salmon and sea trout have unhindered passage up the river. We were pleased to note that, three years on, everything works as planned. We crossed the South Street near Morrison's Supermarket and walked along the path to Asker Meadows. 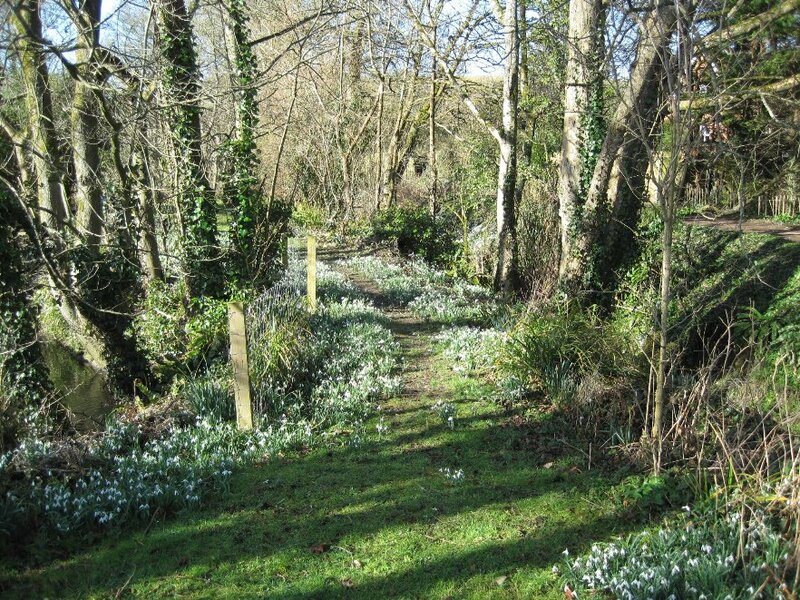 This path has been upgraded in recent years by Bridport Town Council and now provides a very picturesque walk. 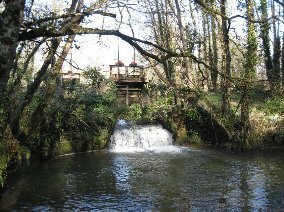 Our first stop was the pool at South Mills, an enchanting area of water hollowed out by the river. 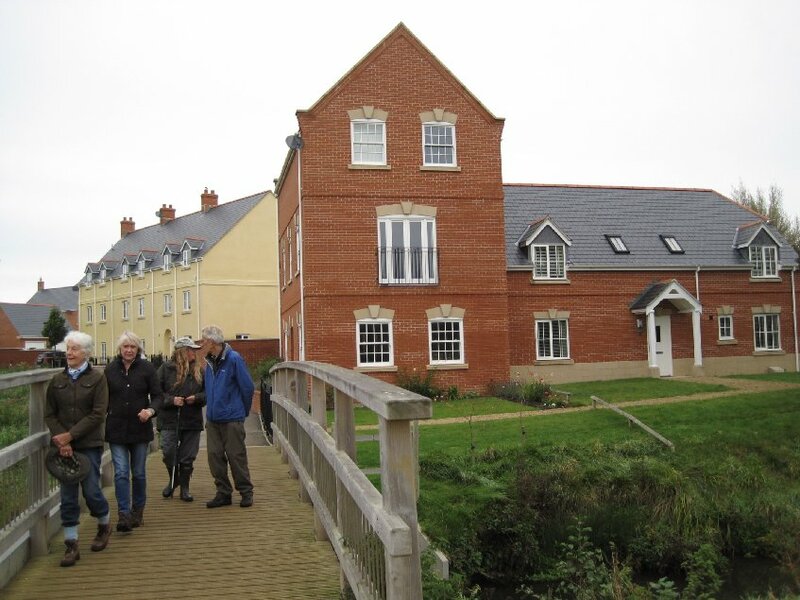 We then walked up to the new bridge linking the new housing development at New Zealand with Asker Meadows. 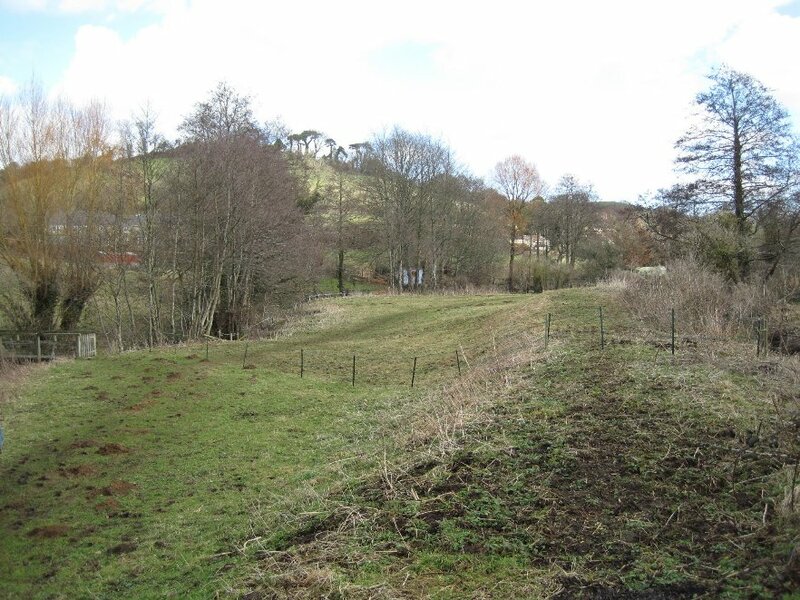 We were able to inspect the area of land beside the development that will soon become a designated nature reserve - a welcome addition to wildlife habitat. 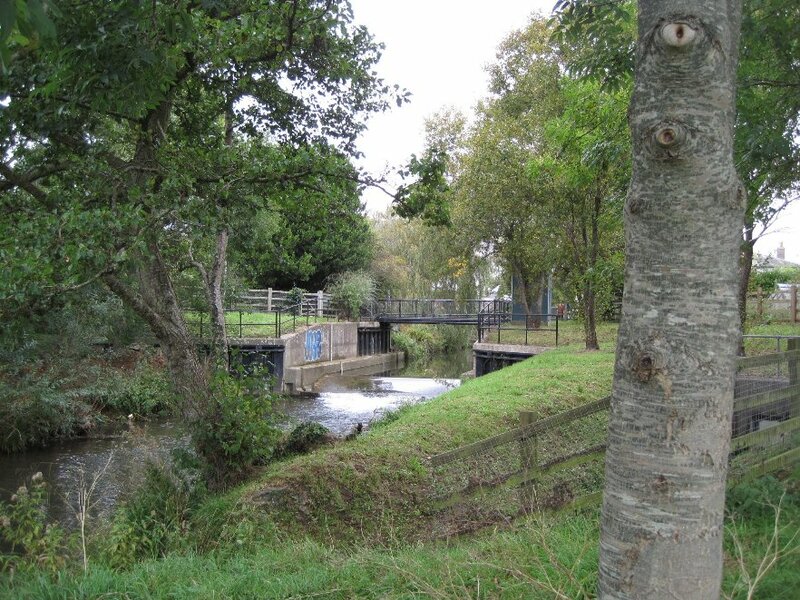 Pressing on, we walked on up the Asker, past the gauging station (below, which is not felt to impede fish migration) and up to the bridge over the river at the easterly end of East Street, near the roundabout. From there it is a short walk along Sea Road North to Jessop's Weir. Dating from March 2010, this was the first of the fish passes to be installed. It is a so-called "artisan" solution, and was constructed thanks to the determined efforts of Roger Genge at the Environment Agency to see what could be done in the absence of funding for a conventional fish ladder. The ladder comprises approximately 25 sections of battens made from recycled plastic and secured to the concrete with steel supports. It is an ingenious design and the indications are that it facilitates a degree of fish migration. Leaving Jessop's behind we made our way over Coneygar and Victoria Grove to North Mills to find extensive in-river works in progress. This was clearly aimed to remove much of the silt which has built up in order to reduce the risk of flooding. Gundry's Weir is part of the flood defence structures on the Brit. It presented an insurmountable obstacle to fish migration as witnessed by the numerous sightings of large fish attempting to leap it during the migration seasons following the completion of the Brewery fish pass. 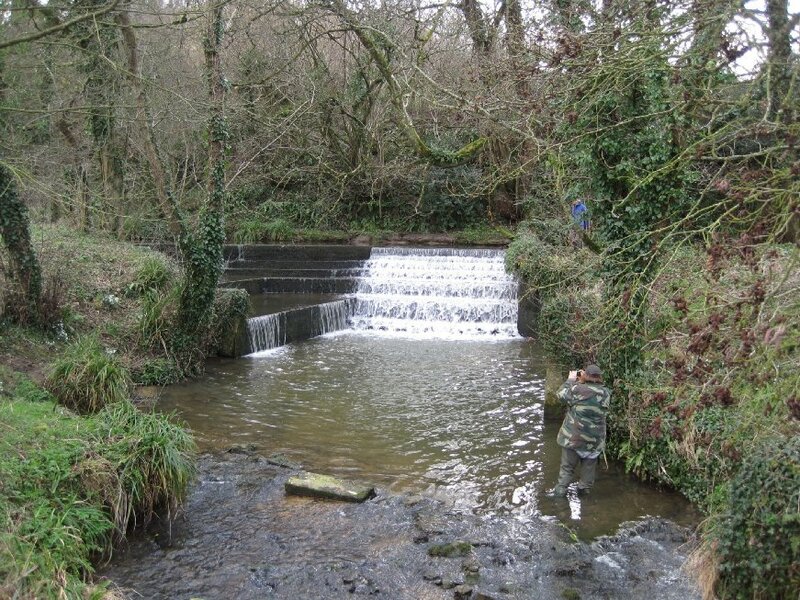 The project to install the fish pass was the result of collaboration between the Environment Agency (who own the weir), Friends of Rivers, Frome, Piddle & West Country Fisheries' Association and Westcountry Rivers Trust. A Programme Board was set up with representatives from each of these bodies to oversee the project which was managed and funded by the Environment Agency. Work commenced in the autumn of 2013 and was completed in August 2014. 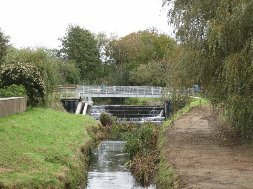 A single flight Larinier fish pass has been installed within the weir against the right bank wall with a separate integral eel pass. Construction involved a series of angled stainless steel plates set into a concrete ramp to disturb flows and allow the fish to climb it. The toe of the existing weir is tied into the entrance (downstream part) of the new pass. 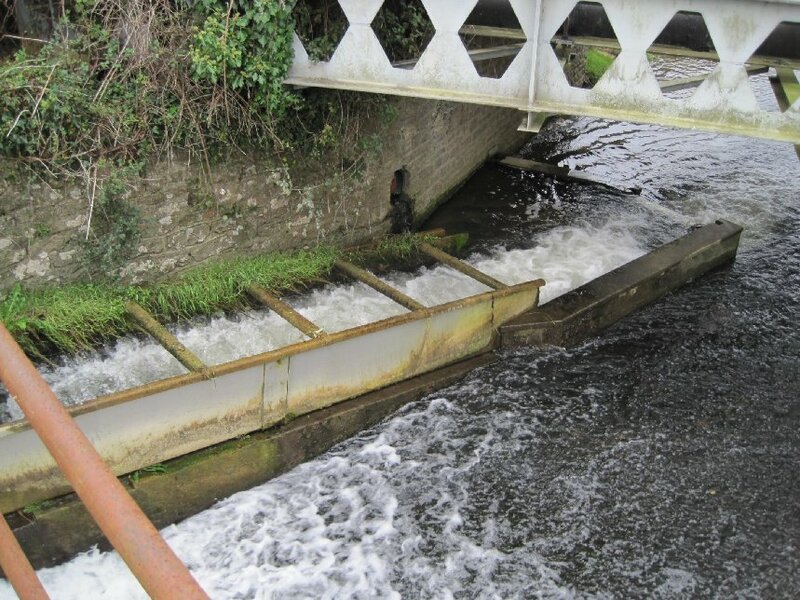 This is to ensure the attraction flow to the fish to ensure they can find the pass as they approach the weir. 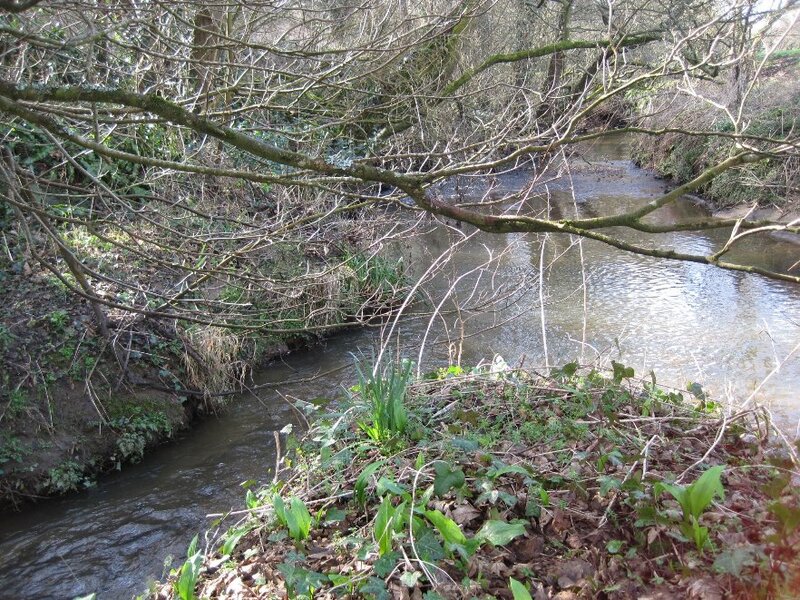 This will result in the Larinier pass extending approximately 10 metres upstream of the existing weir crest. A new single-span footbridge was also constructed as part of the works. With the completion of the fish pass at Gundry's migratory fish are now able to navigate the river Brit all the way from the sea at West Bay, past the Brewery hatches, over Gundry's Weir, past Pymore Weir to the weir at Slape Manor. 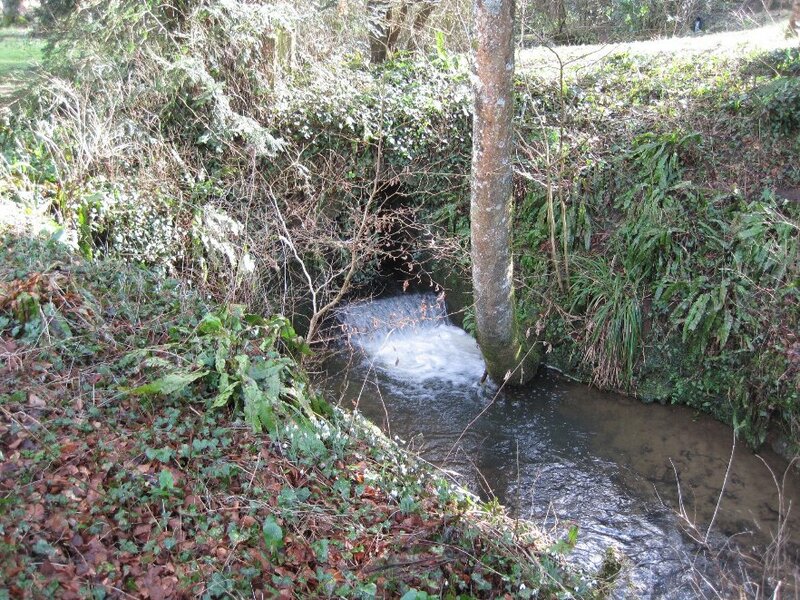 They now have access to some eight kilometres of ideal habitat of spawning habitat above Gundry's Weir. Armed with this knowledge we took ourselves off to the Loders Arms for a celebratory lunch!